Congratulations on your acquisition of Trello! At Netguru, we cannot imagine our daily work without Trello and truly appreciate how productive it makes us. Next to JIRA, which is our go-to project management tool, Trello is the most important tool we use as a company. When the news about the acquisition was announced, we noticed that the community seemed to be quite anxious. The reason was that Atlassian’s products may lack some aesthetic features and Trello itself also has some visual design issues to be solved. We’ve always dreamed of making it a little bit slicker. We think it’s the right time to introduce changes to our favourite productivity tool, so at Netguru, we dedicated some of our working time to it and created an attempt at a Trello redesign. For the time being, we have focused exclusively on Trello's visual experience, bearing in mind all the limitations of such approach. We know that product design should always be based on data and needs to reflect a given company’s business goals. We had no access to real usage data, so we analysed the way our team uses Trello instead. We introduced a number of improvements based on our experience. We tried to improve the look of the cards and added navigation tabs, and now it’s easier to switch between the main view and the calendar. We also introduced a completely new view which gives a summary of all the activity on a given board. We didn’t stop there – it was just a starting point. 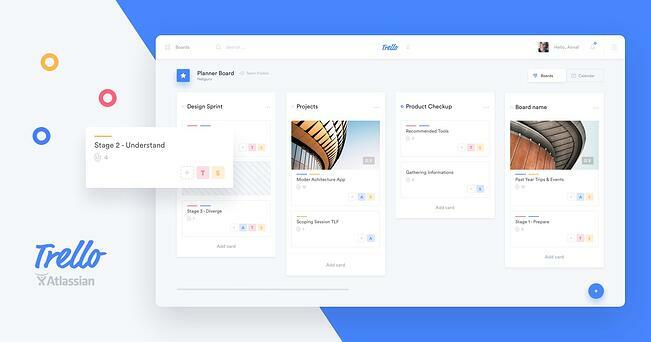 We love Trello for its simplicity and we believe that Trello’s visual design should reflect the simplicity. Having this in mind, we decided to introduce a complete visual overhaul. Now, every board is assigned an individual and universal colour. This allows you to conveniently navigate all the different projects you're part of. Have a look at the presentation on Behance created by our Product Design Team. We hope you’ll enjoy it, and if you do – feel free to introduce the changes to Trello!